Rune books abound. A quick perusal of Amazon, or the shelves at B&N or Powell’s or Borders or your favorite metaphysical store, will soon have your eyes glazing over at the sheer quantity available. But you know the old adage about quantity and quality. Having recently become interested in the runes, I was at somewhat of a loss as to where to begin. I wanted a text that was grounded in primary source material, and written by an experiences runeworker, but also accessible to a complete novice. 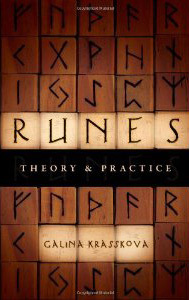 I found exactly what I needed in Krasskova’s Runes: Theory and Practice. Krasskova has been studying and working with the runes for some twenty-odd years. As she notes in the introduction, “this is the book that I wish I had had access to when I was first starting out …. This is the book that I wish I could have given my first students when they came to me so long ago wishing to learn the runes.” Over eight chapters, she analyzes the relationship between Odin and the runes; the runes as spirit allies; the links between the runes and wyrd; and their roles in galdr, divination and magic. Runes: Theory and Practice proved especially useful, and eye-opening, for me for one reason: Krasskova argues that the runes are living, potent spirits. They are not inanimate tools, “inert sigils,” to be used as we see fit and then thrown aside. They are powerful, ruthless, ancient forces that may be allies or enemies or both, and they are not to be approached lightly. If I have one complaint, it’s the typos. For instance, in the section on Sowelo, “lightening” is repeatedly used instead of “lightning.” Hopefully, a second more thorough edit will take care of that problem. Highly recommended to anyone interested in the runes, as well as divination and magic in general, and fans of Krasskova’s other books.